Safety Net Inc is in process of becoming am IACET approved training provider. All training providers associated with Safety Training in New York City must embrace this higher level of training credentials. 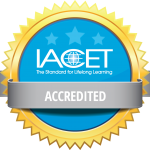 Some of the advantages of IACET include more qualified trainers, better facilities, more consistent training, better recording keeping, clear learning objectives, and the ability to obtain CEUs. This has allowed Safety Net Inc’s already very high standards to be better solidified in standard procedure. · Implement hazard correction and mitigation procedures, means and methods. · Identify NYC DOB laws and OSHA regulations regarding suspended scaffolds as well as comply with these laws. · Use correct procedure to inspect suspended scaffold equipment. · Correctly use and operate suspended scaffold motor including emergency controls. · Correctly install, operate, and tie off rope scaffold using back hitch and night hitch. · Correctly install a vertical lifeline. Tie and use required rigging knots. · Recognize load ratings for suspended scaffold and calculate weights of materials so as not to overload the scaffold. · Implement inspection criteria for wire rope. · Correctly name and recognize different pieces of rigging hardware including shackles, fist grips, turnbuckles, etc. · Correctly use and install rigging hardware, Including C-hooks, parapet clamps, and outrigger beam systems. · Identify paperwork that must be kept at the job site including, plans (CD-5), log books, checklist, etc. · Use inspection checklist to inspect scaffold equipment. · Implement hazardous weather preparation procedures. · Wear, doff, adjust, use, inspect, and care for personal fall arrest system equipment correctly. · Employ correct emergency response procedures and employ self rescue techniques to protect against suspension trauma. · Name and Define supported scaffold types. Name and Define supported scaffold parts and components. · Identify the qualifications, roles, and, responsibilities of a competent person. · Recognize the role and capabilities of 4hr certified Supported Scaffold user. · Value the importance of scaffold design and not over loading scaffold including calculating weight of materials. · Safely use hand and power tools on a supported scaffold. · Recognize OSHA role in regulating safety and health in the construction industry. Have an appreciative attitude about OSHA regulation. · Comply OSHA Subparts: E, L, and M Comply with OSHA 1926 Subpart E Personal Protective Equipment regulations. · Comply with OSHA 1926 Subpart L Scaffolds. · Comply with OSHA standards and NYC DOB for Using and inspecting a supported scaffold. · Identify NYC permit and paper work requirement and Recognize importance of inspection log book. · Demonstrate proficiency applying the principals of fall protection Subpart M.
· Recognize the criteria for scaffold grade lumber including rejection criteria for defective planks. · Calculate fall distance. Correct use, inspect, maintain, don, doff, and store a Personnel Fall Arrest System. · The student must attend the entire learning event and receive the required amount of contact hours designated for that event. This includes adhering to the scheduled start and end time and not exceeding the allotted time for breaks and lunch. · The student must actively participate in all learning event activities including group exercises, question and answers sessions and hands on activities. · The student must pass all written and hands on assessments (exams). If you have any questions or comments regarding any classes or processes please feel free to contact Timothy Vogler directly via this website, phone at 347-604-2121, or email at Tim@safetynettrainer.com.